The Michigan attorney you choose to represent you can mean the difference between you getting a fair settlement or no settlement at all. Receiving the maximum injury settlement you're entitled to is a job for an experienced personal injury lawyer with a winning record. 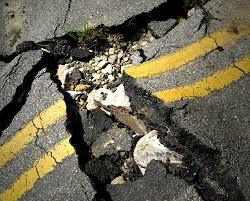 If you have suffered a personal injury due to a defective road in Michigan, we can help you. This is the most common question asked by many of our clients. The answer that no one likes to hear is, "it depends". So, what does your settlement depend on? As you can see, there are a lot of factors that go into determining a fair settlement for your case. This is not even a complete list. No honest Michigan personal injury attorney can answer your question without knowing this information. Our lawyers have been handling defective road cases resulting in serious injury for many years. In fact, 97% of our client's cases are settled without ever going to court. If you or a loved one has been injured and you believe you have a claim, you should contact us right away to go over your options. Call us at (800) 606-1717 and we will listen to your story. It will cost you nothing unless we are able to obtain a settlement fo you. There is nothing to lose!